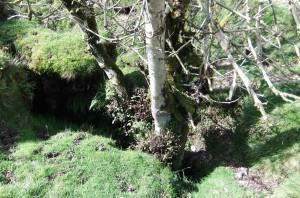 Geology Swallow hole with visible pot hole at outcrop of the Main Limestone. Record Name The Dovecote Hole. 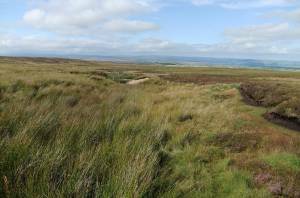 Scargill High Moor.Rowan and associated flora. 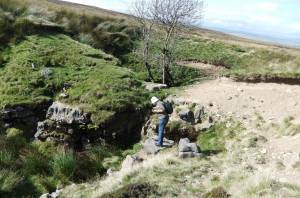 Record Description The Dovecote Hole is one of a linear group of a large and deep swallow holes marking the upper limit of the Main Limestone which is beneath a considerable depth of glacial till. An ancient twin stemmed Rowan is rooted in the limeestone. 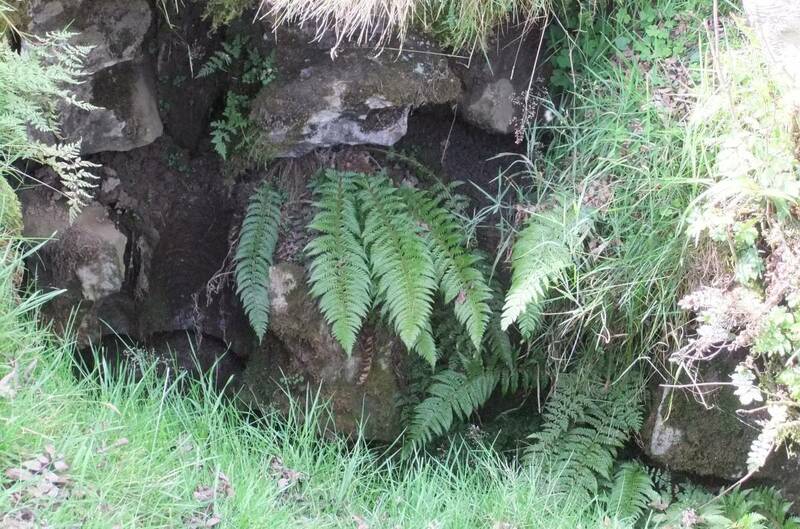 The vegetation at Dovecote Hole (inf. Mrs Linda Robinson) includes: wood-sorrel (Oxalis acetosella),heath dog violet (Viola canina), hard shield fern (Polistichum aculeatum), brittle bladder fern (Cystopteris fragilis), male fern (Dryopteris filix-mas). Whereas an ancient isolated rowan is the only tree here at present the vegetation includes woodland indicator plants characteristic of the woodland once present here. Additional Notes Dovecote Hole may have received its name as the site of a pigeon house or dove cote. If this seems improbable, pigeons housed in coops at secluded locations on the open moor were used by Game Keepers to attract peregrines and other hawks presumably so that they could be more conveniently killed.